I'm currently experiencing a bit of a dry spell when it comes to building. I understand that my creative moments come and go. I also understand that a lot of my personal energy might be taken up by my new job. I still think it's a shame. Because I see the passion and fire that is currently engulfing my fellow MoFØs and I want to participate beyond a few "Atta Boys" here and there. And really, it's not the lack of building that concerns me. All I have to do is dump a set or two out on the floor and I can kickstart those creative juices instantly. What concerns me is all the universe-building going on and my lack of inventiveness on that front. 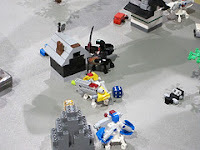 I'm a little jealous of the people that are carving out their own little sections of the MFZ universe. I've written down a few notes but nothing like the work going on over at Orion 6. I also think I'm seeing the first wave of enthusiam die down after the completion of the Kickstarter. I'm sure things will ramp back up again after the completed game is placed in people's hands. It just feels like things are on the ebb at the moment. The Mobile Frame Zero: Rapid Attack page is finally live! Dogpile on Joshua! Mechatonic -- Defunct, but still a great read. Orion 6 -- The other new kid on the block. MFZ Wiki -- The wiki. 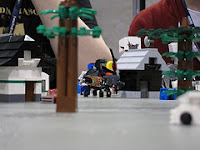 If there are any more locations where MFZ is being discussed, beyond little one-shot mentions of the kickstarter, please let me know so I can include them. If you are interested in Mobile Frame Zero and you are not on one of these three sites, why not? I hate Facebook and I even made an account just to talk about MFZ there. Right now, this is where the action is. This is where you can talk to other MoFØs, see what they are building, show off what you're building, and share your thoughts about the game. There were over 2,000 supporters of MFZ. Let's get everyone in a centralized location so we can all share ideas and enthusiasm. There's been some discussion of this over on the Hangar. The Soldier: This is the design with the most basic loadout. One Direct Fire attachment, one Defensive attachment, one Spotting attachment, and one Movement attachment (2Rd/1B/1Y/1G/2W). It does everything, but nothing well. It was either created by Ced23Ric or Mechatonic. These should be filler units in your army. Armored Spotter: One Defensive Attachment, two Spotting attachments, one free Movement attachment (1B/2Y/1Gd8/2W) This guy has one role; putting those big juicy yellows on the most opportune targets the opponent has. The Blue die enhances survivability. Even still, keep this guy in cover, he has no weapons. 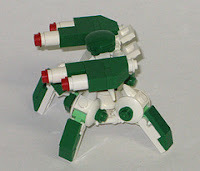 This is the base version of the "Missile Monkey" described back in MD & TD 1. Hammer: One Direct Fire attachment, two Defensive attachments, and one Spotting attachment (2Rd/2B/1Y/2W). This design and the next one are both created by Joshua A.C. Newman. They work together as a team. Anvil: Two Direct Fire attachments, one Defensive attachment, and one Spotting attachment (2Rd+d8/1B/1Y/2W). The Hammer and Anvil work as a team. The Hammer drives the opponent before it placing spots for the more heavily armed Anvil. Lately I find myself turning away from the focal point of the game -- mecha -- and concentrating on the things that make your gaming table look awesome. 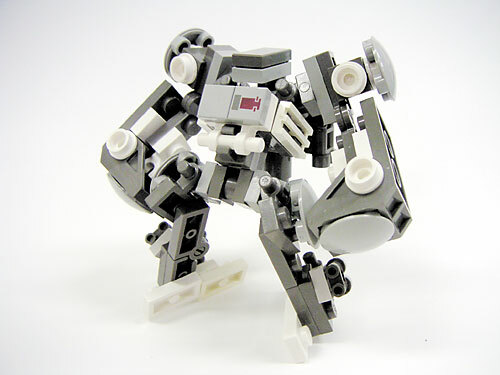 I can understand the newcomers being fixated on mecha, they are the playing pieces of MFZ after all. I just want my playing table to be visually dynamic along with giving visual clues to the story the players are trying to tell. To accomplish this goal I'm building two to three pieces of scenery for each team along with a team-specific station. I guess you could say my goal is making the equivalent of "that" table. The one all gamers go "Oooohh" over and drool when they first see it. This is where I started. 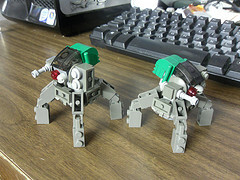 These are built for my team of Spider Mecha. This is my first build for the Butterfly Knight team. Those are Hover Targets, designed to be target practice for ranged weapons carried by mecha. It's part of the stations and scenery for these guys. Here are some Soren designed houses, that I used recently while demoing MFZ at PAX East, and some cars that I made. And this is what it all looks like when put together with some plant life. I hope you all like what I've done and it gives you some inspiration for your own gaming tables. One of the hardest parts of design work is assigning descriptors to specific parts of your build. 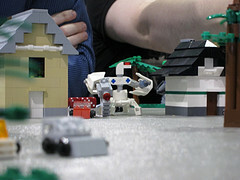 You've built it, now what do all those tiny bits signify? Knowing which pieces come off when you lose an attachment can help speed up the game a tiny bit. Weapons are easy; swords, rifles, and missile pods tend to be visually distinctive. 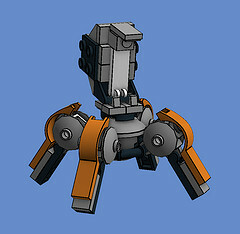 Movement attachments are fairly easy; you can't really miss wheels, rocket packs, and extra legs. Jump jets and jet engines might be a little harder to spot. Defensive attachments are where it starts to get a little difficult. How do we know what pieces are armor and not the actual frame? What does a force-field projector look like? Shields, on the other hand, are the easiest part of this attachment. Spotting is where things go sideways. How do you tell a laser targeter from a gun? Is that a spotlight or the mecha's head? So, please, don't over-Greeble your designs. The other players thank you. The first two make sense, but the third is a complete mystery to me as I'm not a member of that forum. I'm sure the MFZ Facebook group is large but I barely maintain a presence over there. That one there in the middle is interesting. This brings an end to this peak behind the curtain. Here are a double handful of photos courtesy of the people who played in the games! Table View, Black Knight Strongarms frame. That's me in the top right. I'm guiding someone through the dice choices for their mech. Another view of the Spider Mech team. A Strongarms frame takes cover between two buildings. Crab Mechs have been damaged! A mech's-eye view of the Black Knight Strongarms. Alternate view of the White Strongarms. 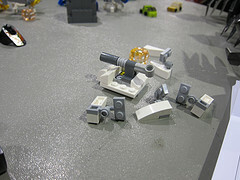 The White Crab Mech has been reduced to a stationary gun platform. This shows more of the confrontation between the Spider and Crab mechs from Game 3. There was someone else who took pictures but they didn't give me permission to post them here. Here are links to those pictures. Photo 1. Photo 2. Photo 3. They're from the set-up/start of game four just before Joshua took over for me. Let's try and maintain this level of interest into the future! I finally got to see a ruler in use in Mobile Frame Zero and the effect it has on the game at PAX East. Before this point I had always used a tape measure. The reasons behind this are twofold. One, I'm a little bit old-school. Two, the original design of the ruler is awful. Sorry, Vincent and Joshua, it just is. 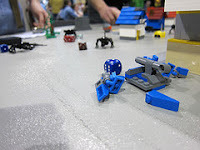 The one Joshua used when running his game is a "whip" of 1x4 Hinge Bricks about nine pieces long. Heh, it's a Nine-Section Whip Chain. :-) The main body of this brick measures 1.25", each hinge adds 0.25". With one unit of movement being roughly 1.5" -- there is overlap where the hinges connect -- this allows mechs to move farther on each turn. 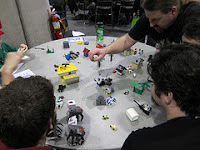 At one point, under the old rules, there was an optional rule that allowed a mech multiple activations if they possessed multiple Initiative dice. Under this rule you could attack multiple times but move only once. Now I understand why. Although I wonder what a game would look like with a modification of that rule allowing double movement only if you use a tape measure to measure movement? I believe I'll be making a Ruler before I play again though. I can't wait to see what effect it has on my gameplay. 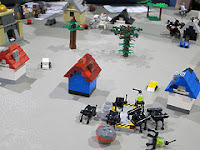 After playing MFZ at PAX East, I came to realize that two more battle field roles were used in one of the games I played. The Artillerist: This design has two Artillery attachments and two Defensive attachments. (2Ra+d8/2B/2W) He doesn't move fast and he doesn't have to. The only time you'll really move this archetype is at the start of the game when he hunkers down behind some cover in a nice shooting position. You'll use his White dice for Defense or Offense, maybe a little of both depending on the situation. When you get good rolls from your primary Red and Blue dice you can toss a Spot on an opponent's mech that's out in the open. You'll want a spotter for this one, to get those really high attack rolls. The Sniper: This design has one Artillery attachment, one Defensive attachment, and one Movement attachment. (2Ra/1B/1G/2W) Take it up on top of the nearest piece of terrain to rain shots onto the battlefield. He moves around to get the best use of cover and range. He also has an open slot to use however you see fit for the coming battle. Mecha Design & Tactical Doctrine 1. First off, the floor space is huge. It's easily twice the size of the main floor at Gencon. The people are all enthusiatic and upbeat. I will try and make it there again next year. I arrived a little after 9:30am and began setting up. Luckily I had some time as the floor didn't open up until 10:00. It took me a little while to get all the terrain set up the way I wanted it and the cheat sheets for all three teams filled out. After the floor opened I spent some time answering questions and talking to people. Sometime between 10:30 and 11:00 one of the people I was talking to mentioned he had brought a team of mechs with him. From that point on the day took off. We started a game right then and there which quickly morphed into a five-way scrum as another con attendee showed up with a set of mechs. This game gave way into another and then a third. We had several people cycle in and out over the course of these games. It seemed like we always had a crowd of observers and people curious about the game. It also seemed like every other person I spoke with was a backer on Kickstarter. Interest and support for this game is very high at the moment. Let's hope it continues onto and past the publication of the game. I managed to keep going until 4:00 when I ran out of steam. Joshua took over for me and I went for a walk to relax and recharge. I came back around 4:30 to watch and answer questions for people. I jumped back into the game when Joshua left. We wrapped things up sometime after 7:00. Frank, Vlad, and another player -- who's name I unfortunately don't remember -- helped me clear the table and put things away. Thanks guys, I hope to game with you again next year. At some point Jerry Holkins, Tycho from Penny Arcade, showed up and watched us play. Apparently he's a huge fan of the game and is really looking forward to playing. I damn near crapped my pants when I realized who he was but I gathered my wits and talked to him for a bit. He came back three other times during the day to watch and talk with Joshua Newman. I had an immense amount of fun. I'd like to say thank you to everyone who participated, who asked questions, and those who just watched. You made my day fly by and enjoyable beyond belief. If you're a reader and have photos of the table from any point during the day, please send me a link. I forgot my camera yesterday and I'm still kicking myself for that. 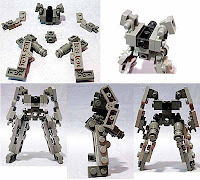 With the massive upsurge in interest in Mobile Frame Zero, a lot of talk has been about getting the parts you need to make the mechs you need to play the game. 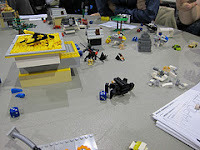 Most of the talk revolves around using Bricklink and Pick-A-Brick to cherry-pick the exact parts you need. While this gets you the parts you need fast it also gives you only the parts you need and no more. You won't be left with spare parts to build Stations and scenery. I'm also a fan of having a stockpile of Lego parts for later use. Star Wars 2011 Advent Calendar. As you can see most of the sets are ploybags. These offer the most bang for your buck; lots of small pieces -- generally of the kind needed for mech building -- and reasonable prices. I saw this one a couple of days ago, 40031 Bunny & Chick polybag. While there are some "enh" parts in the set, it has four Travis Bricks, two Headlight bricks, and some other good parts. It also has 52 pieces and retails for $4.99 USD, which means it falls into the $0.10 per part range which is right in the sweet spot. Also, it's a seasonal item so, if it stays past Easter it'll probably get marked down. Another one that's good, but not in my usual price range for recommendation, is the 5767 Cool Cruiser. It has all the usual fiddly bits we love but, the thing that knocked my socks off was the two Trans-Clear Headlight bricks. 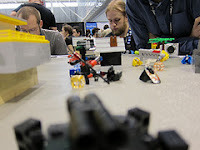 I will be at Pax East 2012 on Saturday helping Johua, Vincent, et al. demo Mobile Frame Zero. Please stop by if you are planning on attending. 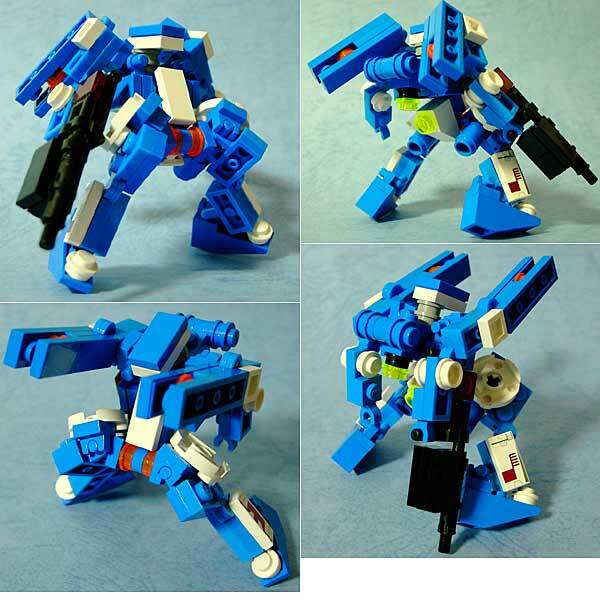 When I had lunch with Joshua a couple of weeks ago, he mentioned that there are close to - or maybe more than -- 100 different combinations for setting up your mecha with each combination having a role and possibly a name. He mentioned one or two names that I have since forgotten. Luckily over on Mechatonic, in their Strategy Guide, they name three; the Brawler,the Stalker, and the Spotter. The Brawler: Two Close Combat attachments, one or two armour attachments. This mech has the speed to get to enemy stations, the power to force defenders off them, and the toughness to stay on them until the job is done. For my money, this is the best station-grabbing mech in the game. The Stalker: One or two Artillery, Movement. 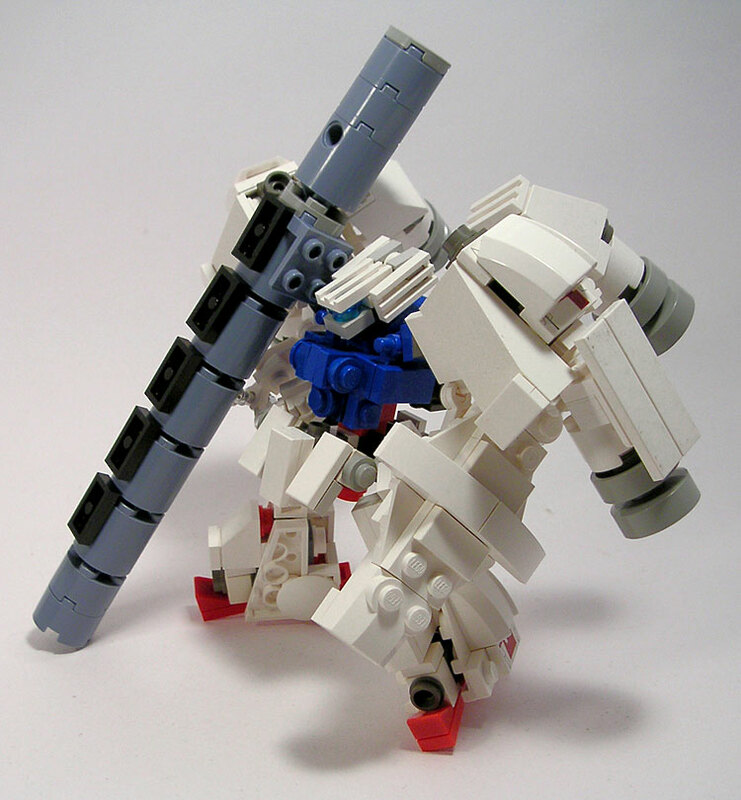 This mech stays on the outskirts of the battlefield, shelling vulnerable targets or ganging up with everyone else. Meanwhile, you’re using that movement die to threaten undefended stations, and to keep out of range of enemy units. In the end stages of the game, don’t be afraid to let them under your guns if it means grabbing a station. The Spotter: Two spotting attachments. A risky design, and possibly not very good. It’s got speed to stay out of too much trouble, and two spot dice makes a good result much more likely. It’s got great initiative too, to make sure you get the best chance to use its spotting. Whether it’s worth a whole mech worth of not shooting, I’m not sure. I have a few more to add to the mix. The Tank: Two Direct Fire attachments, two Defensive attachments. (2Rd+d8/2B/2W) He's not particularly fast but, he takes a beating and dishes one out. He fills the role of a line trooper, neither the specialist nor a leader. This guy holds the middle of the field, slowly moving forward while preventing any of your opponent's troops from getting closer to your Station. The Closer: One Direct Fire attachment, two Hand-to-Hand attachments, and one Defensive attachment. (2Rd/2Rh+d8/1B/2W) This is the first mech you place if you're the Primary Attacker. He starts outside the Defender's perimeter and rushes in to take an Objective. He has enough armor to survive for a little while and the DF Weapon can be ditched to soak damage as well. After the DF Weapon is ditched he gains a Green d8 for movement which allows him to close at high speed and use the two HtH Weapons. The Missile Monkey: As detailed here, having Single Shot Rockets on an otherwise un-armed frame doesn't negate the free Green d8 for having no ranged weapons. So upgrade the Spotter with one Defensive attachment and a handful of SSRs then go to town! Keep this guy in cover and use a SSR if an opponent gets too close. Otherwise, use the double Yellows to light up targets for your heavy hitters. I know the rules haven't been released yet. But, I know there are people out there with copies of Mechaton. I'd like to hear from my readers other ideas they might have had. Let's get a discussion going! One builder whom everyone should be familiar with is Zizy. 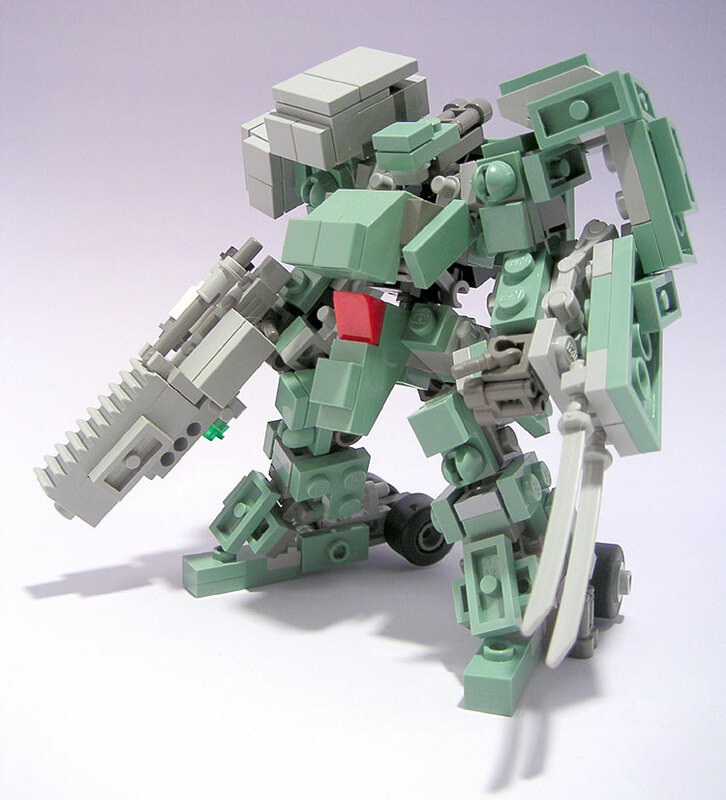 He's been building mecha and posting them online since sometime in 2003 as near as I can tell. As far as I know, he's never officially built anything for Mechaton. He has been copied extensively by other builders though. Hell, even Soren Roberts has copied his work. In fact I think it's one of the rights of passage for the Mechaton/MFZ community; copy a mecha just by looking at a photograph, build a Zizy Frame, etc. Of course people like Kashiwa and Omnipotent might be taking it a little far. Zizy has so many different pictures in his Brickshelf gallery, which is here, that you can get lost in there for hours. One of his most prolific builds is the AF Frame. The best view of which can be seen here. Here's a couple of my favorites built off of that frame. He also has a "proto" frame, seen here. Which looks like this when additional parts are added. Of course he switches things up again with the Vertical Machine frame. Here it is with armor and weapons. I don't think it's unreasonable to call him the Michaelangelo of the microscale mecha community. Go. See. Copy. Learn. Thanks to OrangeKnight Studios for the title. 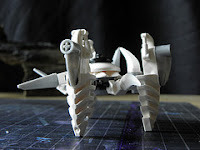 A while back I took a number of photos of mecha designed by other people that I had copied. This ostensibly was to show the size relationship between each frame. But, with the advent of this post on the Mobile Frame Hangar, they now have another purpose. Zeekhotep keeps a list of "official" frames. Maybe this can function as my version. My version of Soren Robert's Hi-Leg (soldier) frame. My version of Zizy's AF Proto frame. My version of Soren Robert's Hi-Leg (officer) frame. My version of Zizy's AFI Stirad frame. In the background of all the pictures is my version of Mixbrix's Tau Drone. My version of Soren Robert's Chub.My version of Ybliss' Kolossus frame. My version of Squieu's Takafashii frame. My version of Pasukaru76's COG frame. My version of Freddotron's Goshawk.My version of Soren Robert's Conscript frame. From Left to Right:My version of Soren Robert's Conscript frame. My version of Soren Robert's Scrambler (expanded). My version of Joshua A.C. Newman's AiN-11 frame. My version of Joshua A.C. Newman's Shiva frame. My version of OrangeKnight Studio's GigaTon frame. My version of KryptonHeidt's Un-named frame. My version of Soren Robert's Gun Crab frame. 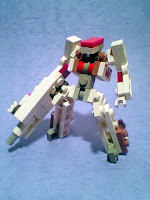 My version of the 5th Gen Ptimanya mech out of the Mechaton rulebook. My version of Malcolm Craig's MgN-3XX Series frame.My version of Ironsniper's Hardsuit frame. 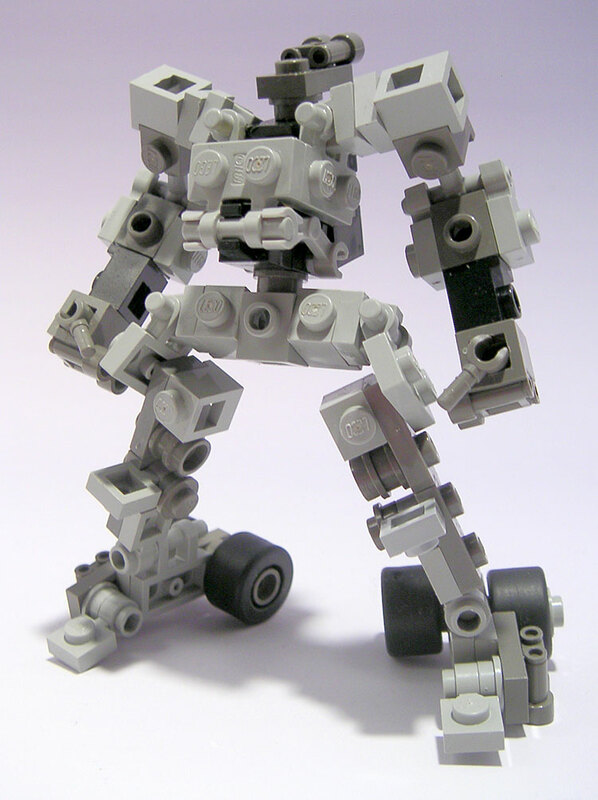 My version of the Walker mech out of the Mechaton rulebook. My version of Sleet01's RDK-11 frame. My version of the Classic mech out of the Mechaton rulebook. 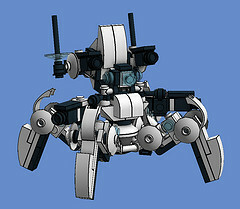 My version of the CHKR mech out of the Mechaton rulebook.My version of ParadoxBoy's Gnome frame. My version of Soren Robert's Scrambler (collapsed). My version of the Space Marine mech out of the Mechaton rulebook. Of course there are many problems with this list: it relies on my fickle taste, I have to build all of the frames myself, etc. The main problem I see is that once I publish the list it becomes obsolete as soon as someone posts a new frame. I hope everyone enjoys it though. The Scrambler, at first, came in one variety, a simple four-legged torso with a couple of upper-body variations. As you can see below. Here's the breakdown for the base model that Soren sent me. This one is really straightforward. As you can see I changed the Travis Brick on the "Knees" to a Brick, Modified 1x1 w/Studs on 2 Sides mainly because I have more of them. I initially thought that this was the least modified of all the frames. 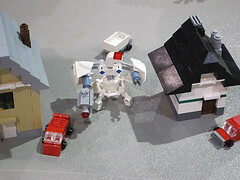 Then I went through the MFZ Flickr group and found more than I expected. Let's look at them, shall we? 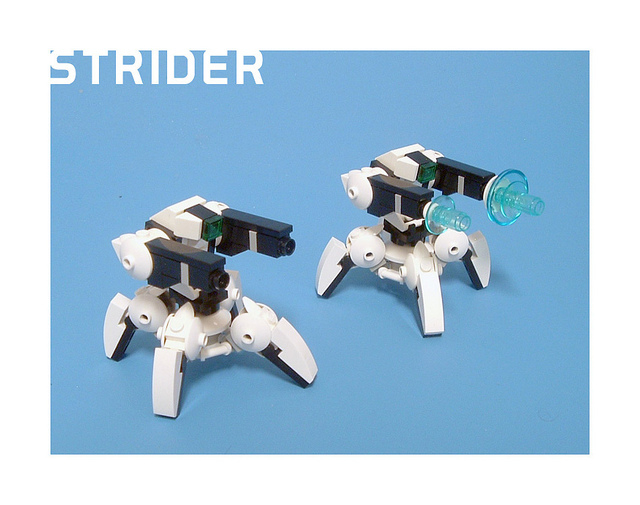 Ijad Strider Precision Gunner by Jed September. This looks to be the first Scrambler mod by someone other than Soren. Combo Strider/Cub by ShaunGamer. ShaunGamer was going to split this into its two sections until Joshua and I convinced him not to do so. Ijad Strider Partial by Lord Dragon Master. This one is only partially finished but it has parts lists in the comments. Hi-Leg Custom by Carbonbass. Carbonbass calls this a modification of the Hi-Leg, but I view it more as a strange cross between a Hi-Leg and a Scrambler. The chunky legs make this really unique. I think all we need to see now is a Hi-Leg/Chub cross. Ijad Bladespinner by True Mortality. Another fantastic build by True Mortality. It's also the only real Scrambler mod out there. Ijad Commander by Lord Dragon Master. 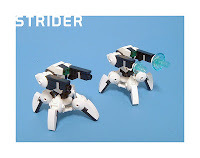 LDM has been working at understanding the Strider frame by copying other versions of it. In this version he really makes it his own. With this post we finish the official frames for Mobile Frame Zero. After this we will be moving on to other non-offical frames.